Is Sugar Ruining Your Health? Dr. Rekha B. Kumar, an attending endocrinologist at NewYork-Presbyterian/Weill Cornell Medical Center, on how sugar consumption affects your health. The statistics are shocking. The average American consumes 17 teaspoons of added sugar a day — whether from sodas and candies, cookies or other baked goods, or seemingly healthier foods like yogurt and granola. At this rate, that’s 57 pounds of added sugar a year. The problem with consuming added sugar? It isn’t just that it offers no nutrients and plenty of calories (for example, one 20-ounce sports drink contains 122 calories of added sugar). Consuming too much sugar can also lead to serious health problems including obesity, diabetes, certain cancers, and even heart disease. Health Matters spoke with Dr. Rekha B. Kumar, an attending endocrinologist at NewYork-Presbyterian/Weill Cornell Medical Center and an assistant professor of medicine at Weill Cornell Medicine, about how sugar consumption affects your health — and how much is too much. What does the latest research show about what sugar does to the body? Excess sugar, especially in the form of high fructose corn syrup, may be contributing to worsening health in many people. Consuming excess sugar leads to a condition called insulin resistance, which is a precursor to type 2 diabetes, a fatty liver, and cardiovascular disease. Insulin is responsible for the body’s absorption of glucose — or sugar — for energy. Those with insulin resistance experience a buildup of glucose in the blood. Soon the body does not respond to insulin as well, and the sugar level in the blood stays higher, which leads to diabetes. Over time, diabetes can lead to nerve damage, vision loss, clogged veins and arteries — perhaps leading to amputations — and kidney failure. What other conditions has consuming excess sugar been linked to? Consuming excess sugar has been associated with cirrhosis, neuropathy, kidney disease, general inflammation, and cancer. In fact, there are several cancer links, such as breast, colon, and endometrial, that are associated with obesity, which might indirectly feed off of sugar in the diet; some tumor cells can use sugar and insulin as fuel to grow. 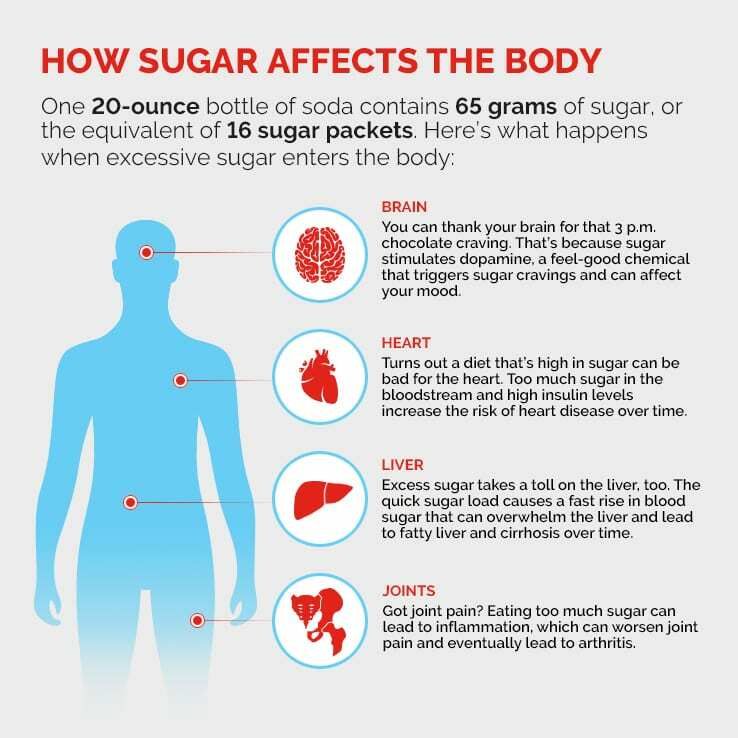 How does your body process the sugar in a soda or candy bar? And how is that different than how it processes the sugar in fruit? Both fructose, which occurs naturally in fruit, and high fructose corn syrup (HFCS), a sweetener used in soda and candy, are called disaccharides and are broken down into monosaccharides, a more usable form of sugar by the body. The amount of fructose from HFCS allows a large amount of sugar to get into the body very quickly as opposed to consuming fructose from fruits, where consumption is limited by fibers and other chemicals that would make a person full before they could get the same fructose load from soda. For example, it would take nine cups of strawberries to equal the same dose of fructose in a 20-ounce soda. Think about that for a minute – most people would likely not be able to consume anything near that number of strawberries to get the same fructose load as a bottle of soda. All sugars are eventually broken down to the same compound, but HFCS is considered the worst because it bypasses some regulating steps inherent in the body, leading to insulin resistance, fat production, and a fatty liver. Can sugar cause other problems like headaches? 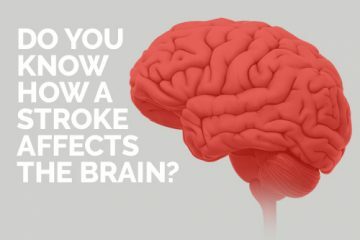 Eating too much simple sugar may lead to headaches in certain individuals due to how rapidly simple or processed sugars are absorbed, leading to a rapid spike in blood sugar and then a rapid decline. This erratic blood sugar pattern can cause headaches, as opposed to consuming the sugar in complex carbohydrates, which are absorbed more slowly. High blood sugar, high insulin levels, and alterations in hormones like testosterone, caused by eating too much sugar, can lead to acne. How much sugar is OK to consume on a daily basis? 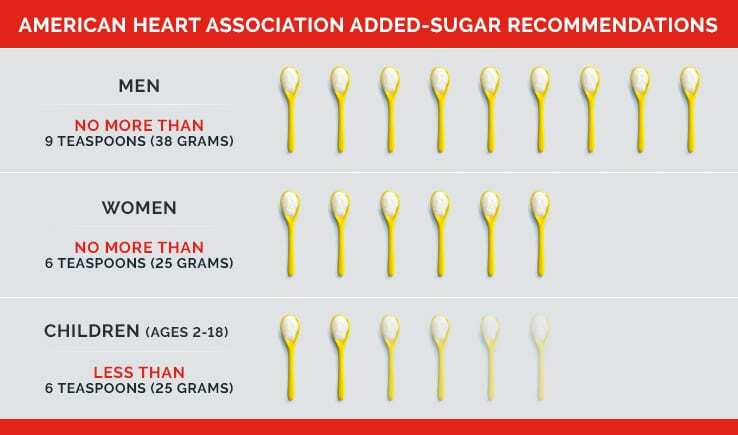 The American Heart Association recommends no more than 6 teaspoons (25 grams) of added sugar per day for women and 9 teaspoons (38 grams) for men. Children between 2 and 18 years old should eat less than 6 teaspoons of added sugar per day. Does eating too much sugar speed up the aging process? One could argue that eating too much sugar leads to aging due to increased stress on cells. 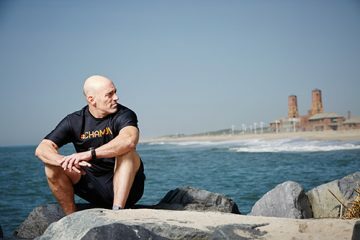 This is not the typical outward aging, such as getting gray hair and wrinkles, but it takes cells a lot of work to metabolize sugar and this can cause “oxidative stress,” leading to free radicals, which are implicated in the aging process. What are the names of hidden sugars to be on the lookout for when reading package ingredients? All of the following are names for sugar: cane sugar, corn syrup, brown rice syrup, barley malt, dextrose, dextrin, ethyl maltol, and there are many more. Rekha B. Kumar, M.D., is an attending endocrinologist at NewYork-Presbyterian/Weill Cornell Medical Center and an assistant professor of medicine at Weill Cornell Medicine. She specializes in the diagnosis and treatment of various endocrinology disorders, including obesity/weight management and thyroid disorders. She is also the medical director of the American Board of Obesity Medicine.